does speed ball Bodemeister hang on this time? just 2 weeks later? 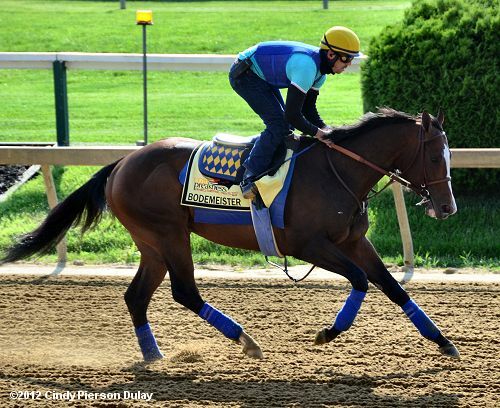 and without further delay, THOROUGHBLOG’S PREAKNESS ANALYSIS..! *he’s the best on paper again, he has the best speed, can he ran that great again 2 weeks after Derby? In Lingerie goes back to the barn with foot wrapped. Emma is fifth on super day of race-riding! 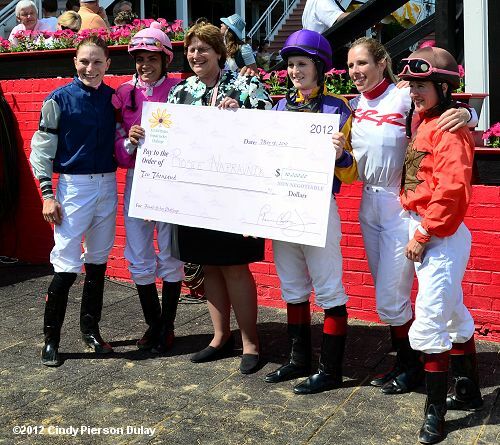 The $31,000 Pimlico Female Jockey Challenge, with 7 jockeys competing in 4 designated races to score points in a 12-6-4-3 format, was part of the Pimlico fun on Black Eyed Susan Stakesa day. Rosie Napravnik, who started her career in Maryland, came home to win the competition with 34 points, 16 more than runner-up Tammy Piermarini. Rosemary Homeister and Forest Boyce tied for third with 12 points each. Defending champion Emma Jayne Wilson was fifth with 11 points, then Greta Kuntzweiler with 10 and Vicky Baze with 3. 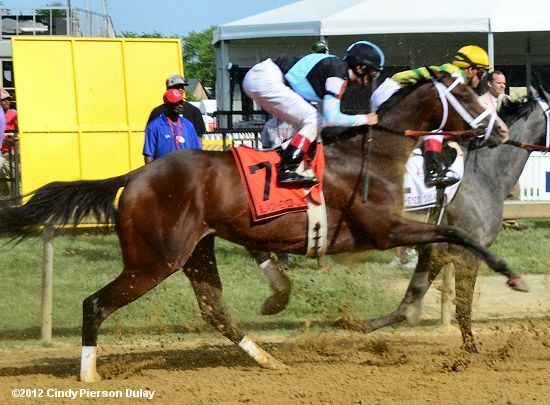 Napravnik locked up the $10,000 top prize check by winning two of the four challenge races. She kicked off the contest winning the 2nd race aboard Silver Tie Affair, and then won the 5th race aboard 22-1 longshot Share Out. 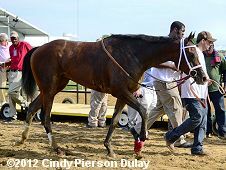 Abby Fuller was scheduled to compete but dropped out following the death of her father, trainer Peter Fuller, on Monday. Emma-Jayne Wilson (far left) and the gals raise money for breast cancer. Saturday, Newbury, post time: 3:40 p.m. IT WAS FRIDAY, SO IT MUST BE FREAKY! There was a nice mix of favourites and longshots for the Friday card and the longshots were wild enough that it can still be called a freaky Friday. The second Pick 4 paid $6,000, ending in the 9th race. Race 1– WON OPPORTUNITY was blasted in her debut when an 8 to 1 longshot (beaten 28 lengths and virtually eased up) but had worked fast since then and won a maiden allowance at 4 to 1 for Anderson Farms and Rod Ferguson. Ian Black trains the well bred daughter of Street Cry (Ire). Race 2– Start of a big day for trainer ROBERT TILLER as IFI’MLYINIMDYIN wins for the 2nd straight time, this time for $25K claiming for 3yos. The Yes It’s True gelding was ridden by Luis Contreras. Race 3 – BEAR’S TIZZ finally won his maiden in his 10th race after being 7 to 2 or less in 8 of those races. He is owned by Janice Attard and won for $40K claiming. race 4- COURTVILLE won an allowance for 3yos, Ontario sired with a nice move in his first 2 turn outing. The son of Saffir – Signs of Glory was bred by Larry and Rosalie Edwards and he is owned by trainer Laurie Silvera, who bought him for $5,000. He posted a 71 Beyer Figure. race 5 – Trainer Sid Attard notched his 2nd win on the card when BROULAN held off longshot Tudor Rule to win her maiden for $12,500. 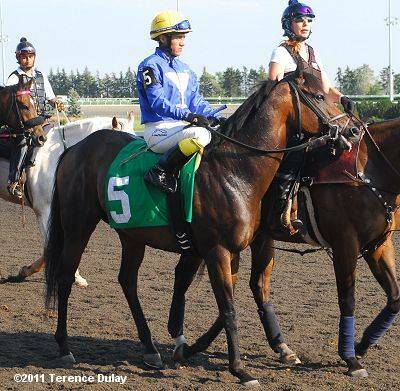 She is an ONtario bred for Robert Harvey. He led all the way to win under Todd Kabel. race 7 – BLUES MUSIC is 2 for 2 this season off the August – April layoff. She ran like a wild horse on the lead yesterday in a 2 turn race and held on to win for Scott Fairlie and jockey Gerry Olguin. The race was for $11,500 claiming. race 8 – PRINCESS PICK, trained by Robert Tiller for Goldmart Farms, led all the way and won at 32 to 1, yep, 32 to 1. The full sister to stakes winner Top Ten List was a $70,000 yearling but had one race in August at 3 to 1 and she was 6th. Nicely prepared to win the maiden allowance off the layoff. race 9 – Beginner Hawaii Dancer, bred by Mike Young, comes from the clouds and rallies inside to win his debut at 20 to 1 for $16,000 claiming. The B C bred gave jockey Steve Bahen the late Double. Winner posted a 63 Beyer.